Material: Silver, shell button (parrot shell, Nautilus) Button diameter: 25 mm Weight: Approximately 3.4 g ~ 3.8 g (one side) Catch: Silver and silicon catch included · Points to note when purchasing Shell buttons differ in the appearance of patterns one by one for natural items. The photograph becomes an image to the last, designation of the handle can not be done so please examine it after understanding. ------------------ * Important notice about goods ◎ Because it will be production after receipt of order, please be appreciated that it will take about several days to 7 days. ◎ Products are manufactured one by one by hand. Please understand beforehand that there are some differences in size and shape with the photograph. 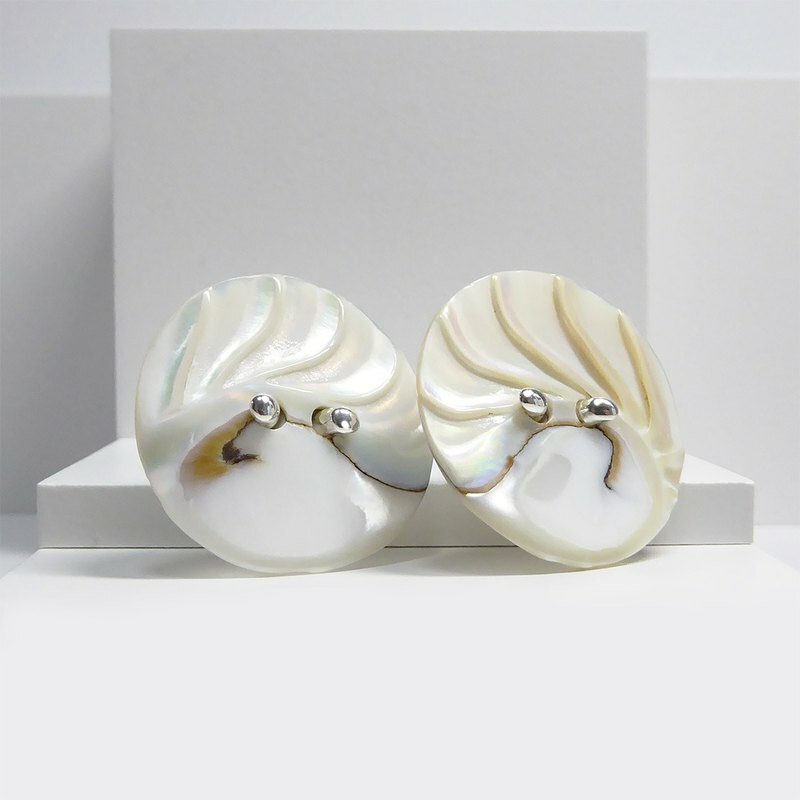 Also, the shell button has the difference between elegant gloss of natural materials and subtle color and pattern, so the same thing is not as two, so the color and gloss, pattern and shape may be different from the picture. Please examine after understanding. ◎ We are made of delicate materials. Please be careful as there is a possibility of breakage due to cracks, etc. when subjected to shocks. ◎ The gap between the button and the metal part is the part of the play which is necessary for the structure when fastening the button. Although it may feel a slight looseness, a button and metal contact sound, it is not a defective item but a mechanism for not breaking the button, so there is no problem in use. ◎ Please wipe gently with a soft cloth such as dedicated cloth or eyeglass cloth as a daily care and remove dirt. When using a liquid cleaner Avoid using it as it may cause discoloration or luster if the cleaner adheres to the button. ◎ Please note that due to the design, for snagging to clothes etc. ◎ Please note those who have experienced metal allergy. Dispatch to domestic domestic will be shipped by letter pack plus. Dispatch outside Japan is shipped by Japan Post International e Packet.